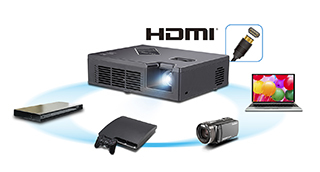 The ViewSonic PLED-W800 is an ultra-portable LED projector with 800 lumens brightness, high resolution widescreen (WXGA 1280x800) resolution and 120,000:1 contrast ratio. With a compact lightweight design, powered USB port and over 30,000 hours of lamp life, this projector is ideal for both home entertainment and office use. Exclusive SuperColorTM technology offers a wider colour range for true-to-life image projection and our SonicMode sound system provides clear audio quality for multimedia content. An optional WiFi dongle allows users to present directly from compatible mobile devices, as well as from wireless HDMI dongles such as Google Chromecast. An SD card slot, USB reader and 2GB on-board memory also allows for PC-less presentation including Microsoft Office documents. Small and Light for Easy Portability. Compact and lightweight at only 0.83kg, the PLED-W800 is small enough to fit in your suitcase, backpack, or in the palm of your hand. 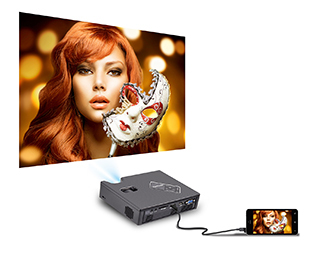 It is the perfect portable projector for mobile sales and business travelers. Best in Class Colour and Sound. 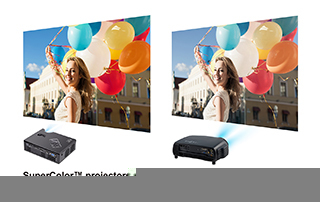 ViewSonic’s SuperColor™ Technology offers a wider color range than conventional projectors. Exclusive color wheel design and dynamic lamp control capabilities project images with reliable and true-to-life color performance. ViewSonic’s SonicMode also delivers optimised audio performance for different applications such as speech or music and movies. Wirelesss and Direct From Memory Card Presentation. Open up a world of wireless presentation with the optional PJ-WPD-200 WiFi dongle. In addition to presenting wirelessly from PCs, Tablets and Smartphones you can also present directly from SD card, USB sticks or 2GB built-in memory. Video, picture and sound is supported along with Microsoft Office documents. Lamp Free for Virtually No Running Costs. 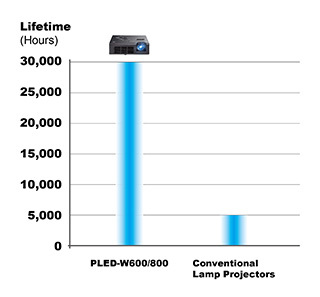 The PLED-W800 uses LED technology that is both mercury-free and lamp-free, offering a greener, maintenance-free projector solution. 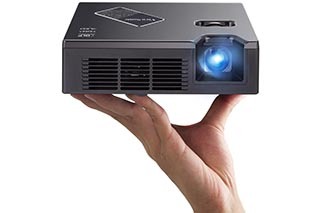 Through its LED light source, the projector provides over 30,000 hours of usage. This helps lower your total cost of ownership. With high resolution (WXGA 1280x800) performance, the PLED-W800 offers a tremendous degree of flexibility and compatibility. 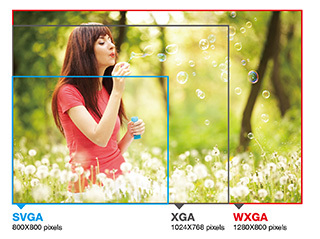 Whether connecting it to a widescreen notebook in the conference room, or watching HD content in the classroom, distortion-free images and aspect ratio matching are guaranteed. HDMI One Cable Connectivity for Images and Sound. Easy Connectivity to Mobile Devices. Integrated with Mobile High-Definition Link (MHL), the PLED-W800 enables users to simultaneously view and charge compatible Android mobile devices, such as smartphones and tablets. Warranty: 2 years on-site warranty for parts and labour.